Monster press. Evergreen Brickworks, Toronto, Canada. I initially thought this was the most massive two rod screw press I had ever seen. The center screw was six inches in diameter diameter with a very low thread pitch. The rods were almost four inches in diameter. The upper and lower platens were doubled, one completely encircles the rod and the other runs along it, which I’ve never seen before. It could squeeze the ink out of a book. But looking closer, the wheel troubled me: it was oddly placed, way too high to be easily accessible, and delicate looking when compared to the rest of the press. Upon reading the nameplate, it turned out this was a scales and not a press. Likely the machine which did the measurement fit inside the platens, and the screw was a way to calibrate it. I also think this machine was connected to the inside of the brick making kiln behind it. 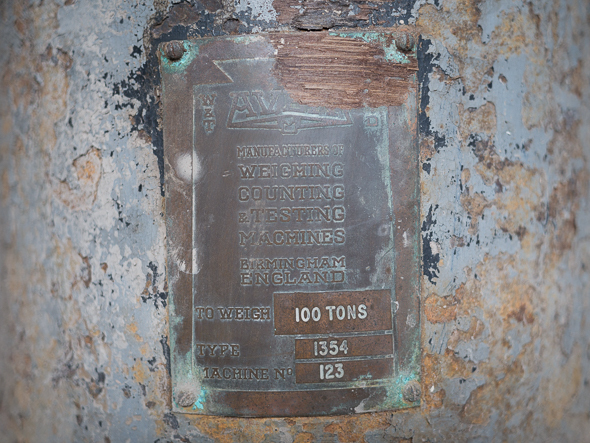 The W & T Avery Ltd. Co., who made this machine is still in business, and one branch of the business is Avery-Denison. They make sheets of PSA stickers to run through a computer printer, very much the opposite end of the weight spectrum from this monster. Detail of nameplate. Evergreen Brickworks, Toronto, Canada. Your press contrasts well with ours, pictured here on Dropbox. It’s three inches high. Beautiful! But was it was modeled on a linen press rather than a bookbinding press? 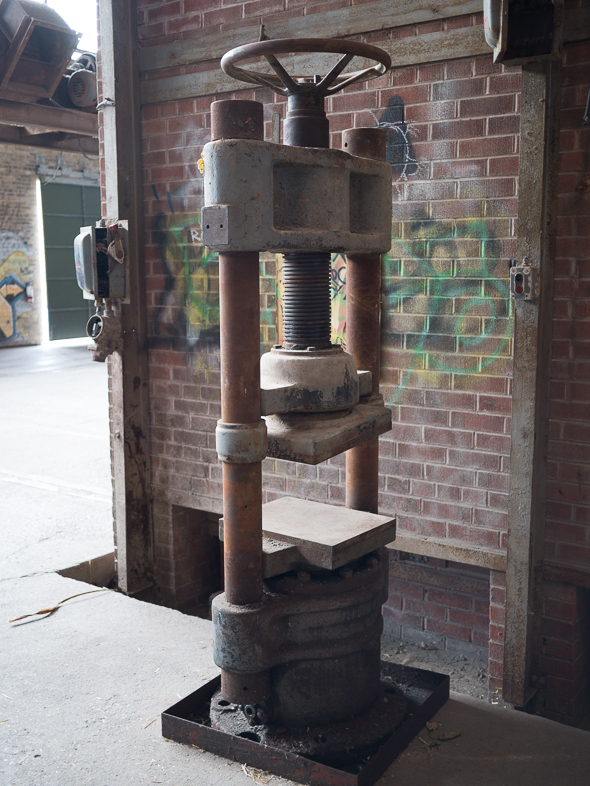 I am quite sure it is actually a hydraulic press, the ram is in the bottom, the screw is to adjust the height, if you look at the bottom you can see an inlet. It will be a 100 ton press, I had two Dennison testers though of a more modern configuration, this is quite a normal old type many of which are still in use in the UK, the pump is missing obviously. Hope this helps!